J.U.M.P., a 501 (c) (3) community service organization based in Harvard, MA, is seeking adults and teens interested in community service opportunities in support of our outdoor adventure based hiking activities. Opportunities available in activities interacting directly with youth on a weekly basis during the school year. 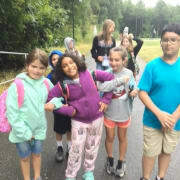 Assist in leading after school nature walks with youth, ages 9-11, from the Boys & Girls Club located at 365 Lindell Ave in Leominster, MA. No experience necessary. If you enjoy the outdoors and this age group of kids, you are in a position to change the course of a young person's life. One day per week, typically 2 hours per day. You will be teamed with an adult with the role of assisting them in keeping the kids safe and having fun as described with our 5 Finger Contract consisting of: Safety, Commitment, Respect, Personal Responsibility, and FUN! J.U.M.P. engages youth in hiking and backpacking as a cooperative sport that allows our youth to gain confidence in themselves as they work together with adult support and learn to thrive in a safe, exciting, and demanding environment. Experience: None required. We will teach you what you need to know and ensure your comfort level in the role you play. Commitment: 1 day per week for 2 hours per day, after school. Currently planning the spring 2019 session.